Here is a link to KPLC video of me and John this morning if you care to watch it. I think it stay up there about a month. I know it kinda looks yucky but I can assure it was divine. 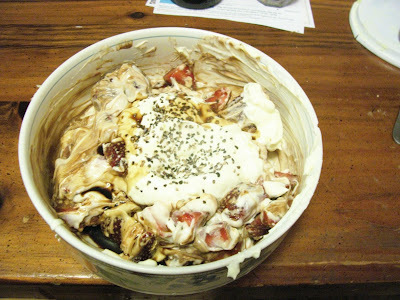 Strawberries and Creole Cream Cheese bought at the Red Stick Farmers market in Baton Rouge with some Balsamic Vinegar with cracked black pepper. 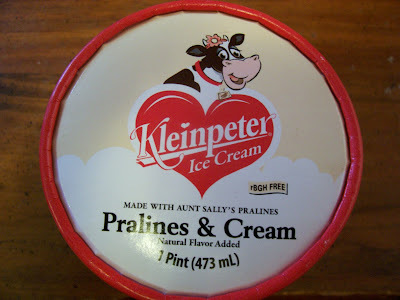 Sweet, creamy, tart and spicy. All about the balance. Last Friday I went over to Jennings to make sure George and Jamie got a copy of the review. They had already and as with many establishments were happy about it. They insisted on treating me. I allow this kind of thing only one time. I am usually happy to pay my own way. I had eaten crawfish etouffee at Clark's so I asked them to give a sandwich that I could eat for supper. George fixed me up a Jamie Special since I had not got a chance to eat it on an earlier visit. 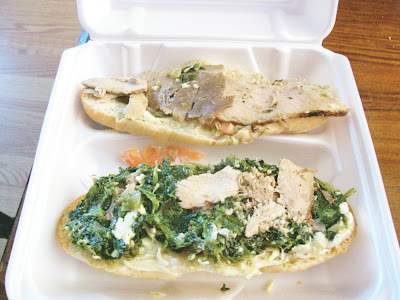 It consists of the sliced Roast Pork with sauteed fresh Spinach, Feta and Provolone cheese. It is a pleasant drive now that the Interstate section at Iowa is finished. I think next time I am getting a George's Special. 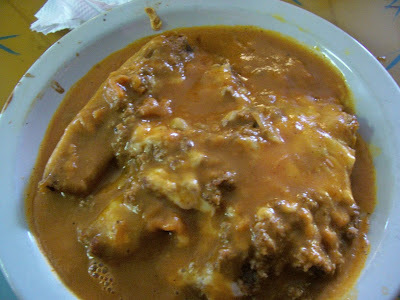 (New Orleans bread company) loaf they put cheese then ladle on tender beef strips in a thick gravy, a knife and fork type of sandwich). Slow roasted hunk of beef that is pulled then simmered in fantastic gravy made for the drippings. Does not get any beefier or better than this. The other thing I had to have was a “Mojo” pork po boy dressed. Picnic ham soaked in a Cuban Citrus marinade and then slow cooked until tender. Then it is sliced and put on a loaf with cheese, lettuce and tomato, tender, moist and full flavored. I could exist on these two sandwiches for quite awhile and not complain. Next round I brought some friends. While most got things I had got or was getting one of them went for the Jamie Special. It consisted of the sliced Roast Pork with sauteed Spinach, Feta and Provolone cheese. I did not get a taste (somewhat difficult with sandwiches and think this person wanted all to themselves). However it did look delicious. I opted for the Cuban. Sliced “Mojo” Pork, smoked ham, Swiss cheese and sliced dill pickle with mustard smashed together on flat sandwich press. The meats and cheese meld tighter and the bread collapses into a crisp crust with virtually no crumb. This one possessed a good balance of meat to bread. Most ones I have eaten had too much meat. Last time in was Muffuletta time. In sesame seeded round loaf they started the construction. A layering of Genoa salami, smoked ham, and mortadella repeated twice then a layer of smoked provolone on top of that. Then came the in house olive salad. I really liked this one since it was not just olives. It contained marinated vegetables (carrot, celery, onion, and red bell pepper) cut in the same size as the green olives in tangy and luscious olive oil vinaigrette. It had a bit of crunch. The best muffuletta I have had in awhile. I also got a Lenten special which was baked salmon in lemon herb sauce pressed with cream cheese. Nice salmon flavor and vaguely reminiscent of lox and a smear on a toasted bagel. I encourage all to go and explore this little place with the big flavors. Well worth the half-hour drive and back. For those who care to watch me I will be on Sunrise on 7 on Thursday April 30 at the 411 spot which is usually at 6:15.
we will be featuring wines from Turnbull Winery. A representative from Turnbull will be joining us for the evening to discuss the wines. The dinner is $100.00 and includes tax and tip. We still have a few seats available so please call today, 337-981-0108. Thanks and we hope to serve you soon! Reminder to everyone about White Lights in Midtown this Thursday, April 30th from 6-9:00pm. All of the participating midtown businesses will be opened extended hours showcasing their products and offering specials. Try to come out and show your support! Here at Regalia Cafe and Market, we will be offering $1.00 off all imported/domestic cheese and $0.50 a pound off all domestic/imported olives in house. In addition, we will also be offering special pricing on all liquor, wine, and spirits. Come out and take advantage of these specials, along with much much more! Imperial Calcasieu Museum, Stacey's Armoire, TeCi's, The Paper Place, Bella Cose, La Grenouille, T-Fig, Focal Point Antiques, The Perfect Gift, Louisiana Market, Jon Margeaux, Once in a Blue Moon, Honey Luv Lingerie, Accessory Zone, Benchworks Fine Jewelers, Precious Gifts and Baskets, My Favortie Things, Cruella's, Artesia, Chez Cafe! I get a lot of info direct to my inbox. For the next week I am going to post verbatim ones I fell might interest you all. Next Monday I will put a poll and you can decide if that is something you want me to do or not. Following my esteemed colleague Eric Cormier recommendation I went there today to eat the crawfish etouffee. It is as good as he says. Here it is. You get the etouffee with a side vegetable (I chose cabbage) rolls (just out of the pic) and a tiny square of bread pudding. There is also a shrimp option. One of the better etouffees I have had. Mildly spicy with a rich seafood flavor. The cabbage was outstanding also. 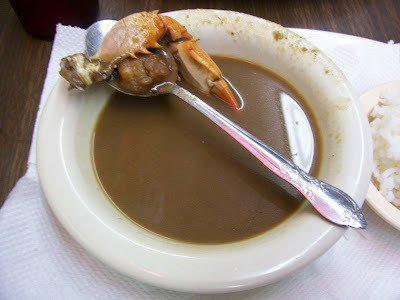 Smothered down with a black pepper bite. Never could figure out what make the bread pudding that color. Looks like cake to me. It was very moist with lots of the sweet spices. 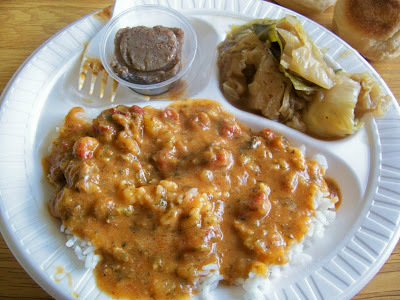 You need to get over and savory a real etouffee. 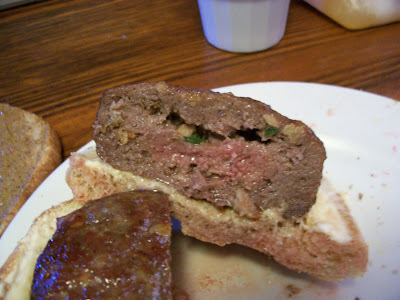 When I go to either Central Market in Houston or Whole Foods in Baton Rouge I always get the flavored raw hamburger and seafood patties and raw sausages. I did pick out some sausages but must have left them on the meat counter because I was not charged for them and I did not have them when I got home. Anyway here are the burgers. The first one does not have a picture because the camera was in the vehicle and I did not feel like getting it. I really need to get one for the house and one for the car. Anyway it was a Spicy Steakhouse Burger. They mixed in an in house steak marinade called Theo's. It consisted of oil, vinegar, brown sugar, onion, garlic, and water. 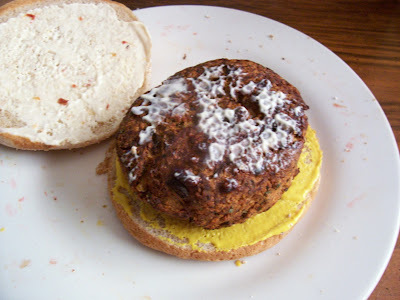 Cayenne pepper and sea salt were also in the burger. This turned out quite nice. Meaty and spicy. 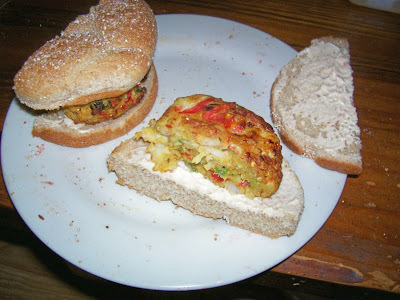 The next two pics show the Jalapeno Cheddar Salmon Burger. It contained wild salmon, Jalapenos, cheddar cheese,black and red pepper, allspice, paprika, natural hickory smoke, garlic and breadcrumbs. Nice and thick with a good salmon flavor. It was also very spicy. At my limit but I persevered and ate every bite even though at the end my mouth was on fire. The salmon and Jalapeno went well together. I bought a fillet of Char and when I cook it I may have to make a basting sauce of chipotle. I also bought some fig preserves at The Red Stick Farmer's market. That mixed together sounds good. As I go through my other seafood and meat I will try to post. Right now I have a sea bass steak defrosting along with some lamb. My sister, cousin , friend and me went to Baton Rouge to grocery shop Saturday. After hitting the Red Stick Farmers Market on Fifth St and the Whole Foods on Corporate Drive we ate at a branch of this restaurant across the street. It was proclaimed by all as delicious. Between the four of us I got enough material to do a regular review. I just wanted to let people know that it is still open and still good. 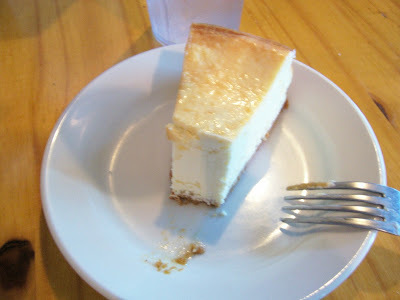 I ate at the Government St one (since closed) 20 years ago and it was just as good. I had some split feet from my half of the hog. I cooked them in the pressure cooker the other day. I dumped in the feet straight from the freezer. I added a sliced onion, a good portion of Rex dehydrated Trinity with Garlic and a box of beef stock. I then looked in the seasoning cabinet and put in various things. Mainly Big Daddy seasoning. I then added water to cover all. Slapped on the lid and started. With the frozen feet it took a little longer to get to pressure but it was there soon enough. After 50 minutes at pressure and a natural cool down the feet were falling off the bone and quite tasty. Now this is spectacular. Redfish on the Half Shell. Redfish fillet grilled with the skin/scale side down. 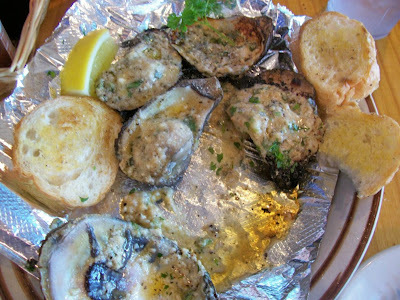 Topped with our garlic butter. It was lightly seasoned then put it down on the grill and never turn it. The skin took all the direct heat allowing the flesh to slowly cook. 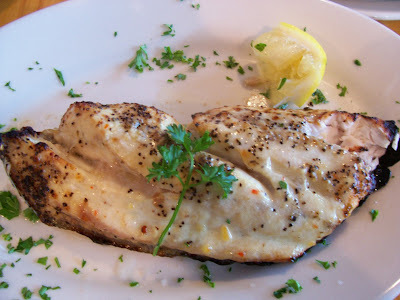 The skin is charred black and inedible but the fillet is moist, flaky and flavorful with the taste of the redfish coming through. With a squeeze of lemon I was not in hog heaven but fish paradise. Worth going to just for this dish. As a side I got the Creamed Spinach. 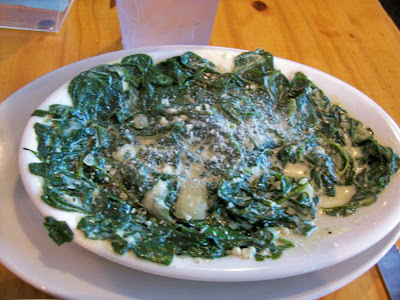 Baby spinach sauteed with butter, onions, and garlic then they add cream and mascarpone. There is also an anise flavor in there. Traditionally it would be Pernod. Again an excellent dish. Not as heavy as some creamed spinach dishs I've had but full of flavor. You can taste all nuances of the spinach without your tongue being coated with fat. Again a dish I would order again. I love a hamburger that has been BBQ or smoked. This place does a really good one. 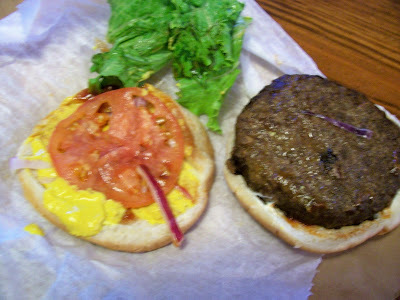 As you can see a nice size patty with green leaf lettuce, tomato, onion, pickles, mayo, mustard and BBQ sauce. The taste is wonderful. The smoky meat meeting the tangy mustard and spicy sauce. Ok I took lots of pictures but never could get on in focus. This is the best of a bad lot but I think you can see what I am getting at. 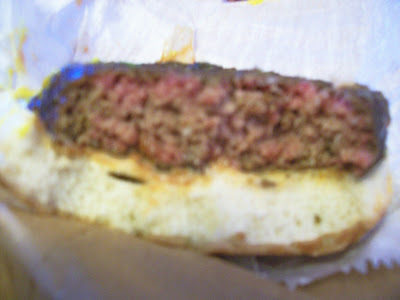 The reddish pink on the burger is not undercooked meat but a smoke ring. I love it. I would rather eat smoked hamburger than any other kind. When I work at the mill in DeRidder and commuted back and forth there was convenience store/BBQ joint just north of Sam Houston Jones Parkway at the curve. 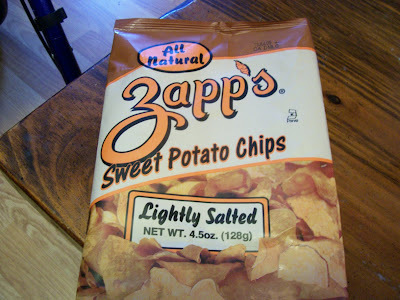 This is where I developed the taste for these. They did killer ones and whenever I did not feel like cooking I would stop on the way back and pick some up. I took Good Friday off. After finishing up my taxes (yes I usually wait this long to do them) I decided to treat myself to Clark's crawfish etouffee. Closed for Good Friday. I have been trying to go to Nina P for the last couple of weeks. Never seem to hit it right. Closed for Good Friday. Aha Dana Kaye around the corner. Closed for Good Friday. I know O'Charley's would not be closed and they have decent food. However when I got to Sale St. This place popped into my head. I usually go for breakfast but I know they do plate lunches. Plus they had just expanded into the adjoining space so what the heh lets see if they are open. Eureka. The plate lunch was over stuffed. 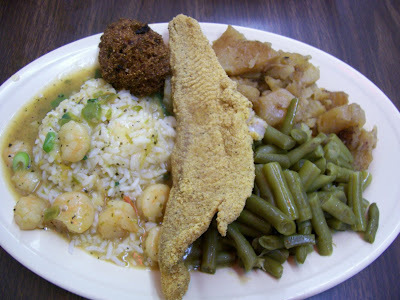 You got a fried catfish strip (light cornmeal crust done just right crispy outside moist interior). A real honest to god in house hush puppy not a pre fab. Had corn kernels and onion in it. 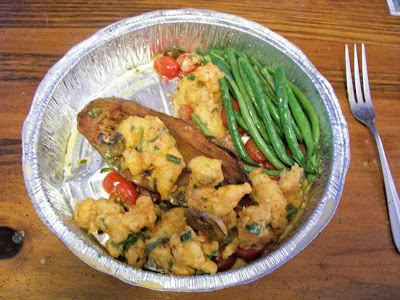 Doctored green beans and their fantastic grilled potatoes came as sides. They also had spicy shrimp and rice. I was expecting a dark shrimp stew kinda of thing. 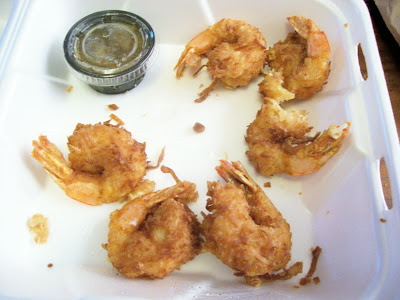 What I got was a light sauce with shrimp and green onions. There was a spice in there I did not like and could not put my finger on. So the shrimp did not work for me but the rest of the meal was outstanding and exactly what I was looking for. I peek into the new room. A nice little bandstand with a bar and extra tables and chairs. Decorated in the sports theme. Next came my favorite here. Cocktel de Cameron. 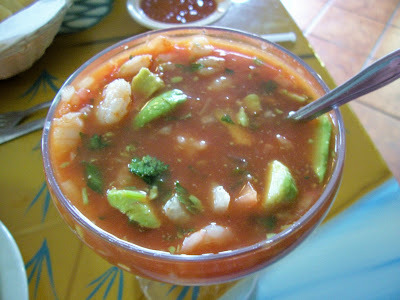 A sweet and spicy gazpacho with a ton of boiled shrimp and avocado slices. They use to present this in a depression era green glass. Now they do in a large martini glass. By the way this is a small which goes for about $5. 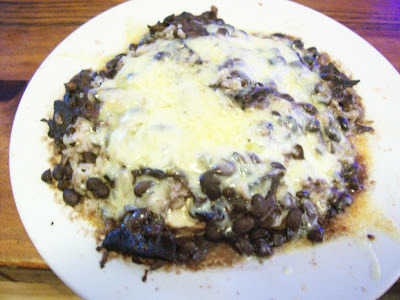 They had lots of onions and red jalapeno in this one. 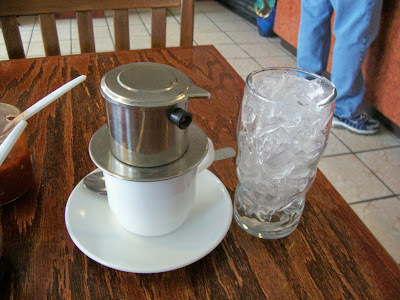 It starts out with a sweet flavor but the heat slowly creeps up on you. By the time I finish one I am sweating but I am addicted to that sweet heat. As hopped menu offerings, seating and market items have expanded with time. In the spirit of Lent I give you the non-meat items available. First of all I tried the Falafel Wrap. 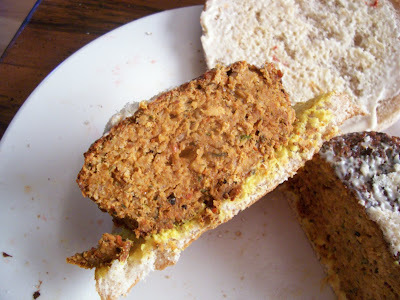 Falafel is a mixture of fava beans and chickpeas ground with herbs and spices. They are formed into patties and then fried. Put in a pita wrap along with hummus and tzatziki sauce, delicious. If you have never had them the texture and taste will satisfy a meat eater. It especially nice here because it is fried to order. Definitely my favorite thing here to eat. Next up is the Veggie Wrap. This contains olive mix, hummus, tzatziki, mozzarella and tabouli in a pita bread wrap. A light and refreshing alternative with wonderful flavor and great balance of flavors. Runs a close second. They also have a no meat platter. It’s items are a spinach, onion and potato filled kibbies, spicy tomato and rice stuffed grape leaves, a pasta salad with feta cheese and olives, mejadra (lentils and rice) and hummus. Spinach lovers will enjoy the kibbie. The contrast between the fried Bulgar and spinach make a nice contrast. The grape leaves have a clean spicy bite to them, my favorite on this plate. 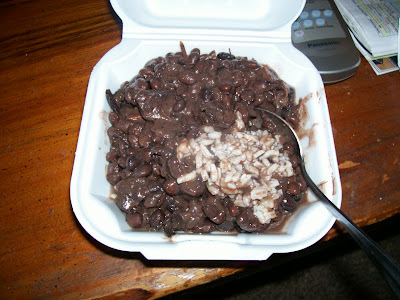 The pasta salad has a wonderful olive flavor and the mejadra rings true to a red beans and rice guy. The regular meat platter has change a bit. 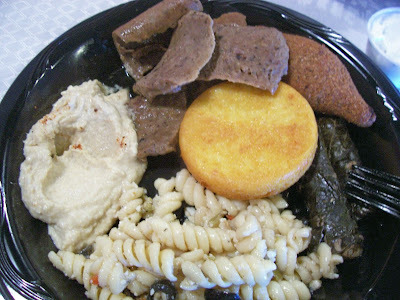 It now has the pasta salad and yellow rice along with sliced meat, regular kibbie and regular grape leave. This is not a fast food place. This is take your time and unwind while savoring great coffee, food and conversation place. See you there. This hole-in -the-wall Dim Sum place in Rice Village is like no other place you have been to, small (sits maybe 30 people) and quite stark. It is all about the food and not the atmosphere. Also no carts roll here. You order “a al carte” from a paper menu with abut 60 options. In a ring system on the table are pictures of the food items so you can see what you are getting. They make everything fresh and bring it to your table as it is finished. Do not expect to see everything arriving at the same time. If you have patience you will be rewarded with excellent food. Service itself can be rude especially if you are not a regular. So hang tough and forbear for the reward. First to hit the table was Jook with Pork and Preserved Duck Egg. This is rice gruel, which I absolutely love. A lot I like about dim sum is the mouth feel of certain items. I must have Chinese genes because I love unctuous gelatinous textures. The 100-year-old egg in the Jook was just the white, which turns black during the process. They tasted like unflavored jello. The pork lent great flavor however. Next came Foong Jow. Really nice large braised chicken feet in soy. They had lots of skin and scrumptious sticky gelatin. Ngau Pak Yet appeared. Braised beef tripe with ginger and spring onions. 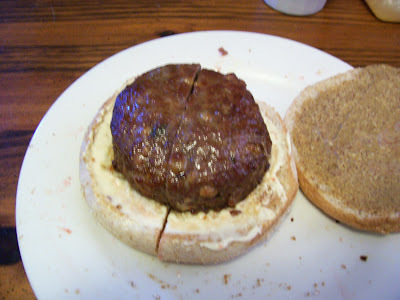 It proved to posses a light and snappy taste with just the right mouth feel (not at all chewy) and melted in the mouth. The ginger made all the difference in the flavor. Ngau Tow followed. Steamed beef stomach with a black bean sauce and chile flakes. A bit chewier but still good texture. The spiciness of the dish made it that much better. Next came Law Bak Go, turnip cake (maybe my favorite dish). This one contained pork and shrimp. It is kind of like a stiff pudding with a mild turnip taste that has been pan seared. 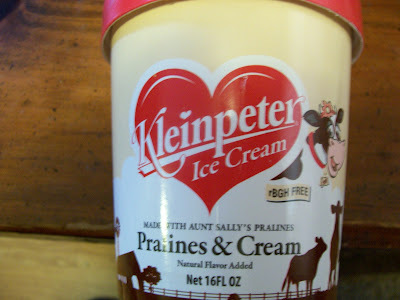 The mouth feel and taste make this a must have for me. Chai Sui So is a baked BBQ pork bun. While OK I prefer the steamed kind (least favorite of the meal). For a bit of sweet I got Dow Sai Jen Ban. It consists of red bean paste stuffed in a rice flour pastry steamed then coasted with sesame seeds and pan sauteed. Just enough sweet without being cloying. All in all, the best dim sum experience I have ever had. I have eaten dim sum in San Francisco, New York and London, none better. 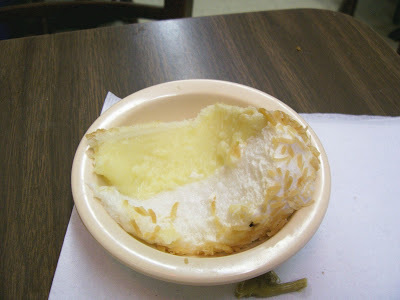 If you are in Houston and are a dim sum nut like me give it a try. Patience is the key. Bun Bon Hue. 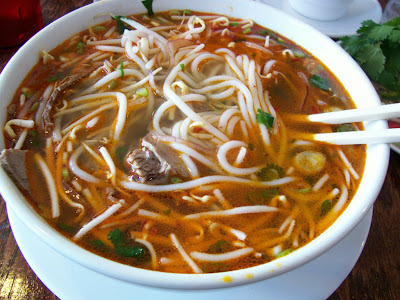 The soup from Hue (ancient capital of Vietnam) It is a spicier version of Pho with both pork and beef. This is a minimalist version. It just has slices of beef and pork. Other versions I have had contained all kinds of body parts. The noodle here are still rice but larger.